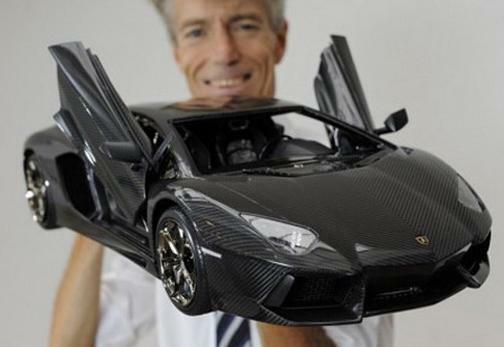 $4.8 Million Dollar Lamborghini – and it’s a 1:8 scale model! The scale automotive collectibles market is about to get a bit of the world’s attention, and a new, one-off model is about to take its place as the reigning objet d’art. Former Mercedes-Benz engineer Robert Gulpen went to the extreme – some might say way extreme – and is scratch-building a 1:8 scale replica of the new Lamborghini Aventador LP 700-4 that is destined to become the world’s most expensive scale car model. Some of the car’s projected multi-million dollar asking price will have to do with engineering and craftsmanship, to be sure, but Robert didn’t skimp on the materials, either: wrapped in authentic carbon fibre and gold, the Aventador’s body surrounds a solid gold and platinum interior. Yes, we said solid gold and platinum. And if you’re thinking of taking a shot at the car’s glorious guts, stop right there: the model will debut (and ultimately be displayed) inside a specially-made case of the bulletproof variety. You can’t be too safe. If you’re starting to get the idea that Gulpen used nothing but the absolute best materials on this masterpiece, you’re right. The total for the exotic metals and various high-end pieces used to build the replica came to a whopping 2.8 million dollars… before assembly. Get your check books ready; Gulpen’s website notes that the Lux-level toy Lambo will go up for auction at either Sotheby’s or Christie’s, out of either New York, or Dubai. The starting bid? 4.8 million dollars. We’ll be watching this one, for sure. To learn more about Robert Gulpen and his scratch-built masterpiece, visit his website. I love this car !!! It should be stuck in a box stuck in random shipping box SOLD AT WALMART letting some random Joe score this car making him richer beond his wildest dreams and then some rich guy can jump in and buy back. Sure would make good TV …..get me?